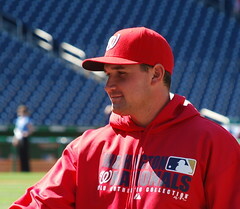 As was widely rumored this morning, Nationals’ 3B Ryan Zimmerman was officially revealed as this year’s National League Gold Glove winner at Third Base. Zim lead the NL at his position in defensive chances, assists and games started, and his play was pretty spectacular on the defensive side. Zimmerman is just the second DC player to receive the honor, and the first in 49 years, since Senators catcher Earl Buttey won it in 1960. Way to go, Zim! Here’s hoping it’s the first of many.